Five of us gathered at Walberton Pond on an overcast day for the long ride to Shoreham Airport: Edwin, Jill, Colin, Phil & Mary. We took the usual route through Madehurst to Whiteways and descended to Amberley, then followed the road through Parham Park and on to Storrington. From Storrington, we followed the main road in increasingly heavy rain to Wiston Tea Rooms where we took our refreshments inside for a change. When we left the T-Rooms, the rain had eased and we continued north and then turned right along a minor road, right again along a B-road, and eventually arrived at Steyning. From Stenying, we took a minor road at the East of the Village which led south through the Downs to the A27 and the back entrance to Shoreham Airport which we reached at about 12:30pm. Shoreham is now used for commercial flights and the restaurant was full of people. From the Airport, Colin navigated us to the coast and along the front to Worthing, then through the housing estates to the Look and Sea Centre where we stopped for tea. The Littlehampton Lifeboat "Blue Peter" was being serviced on the slipway. By the time we finished our tea, the weather had taken another turn for the better and the sun shone as we continued to the main road (the footbridge was closed) and then along the bike track to Yapton, Barnham, Oving, Merton Pond and home shedding riders as we went until finally Jill continued alone to Hunston. Wednesday 9 August . Evening Ride, Felpham start to The Bader Arms, Tangmere. Sunday 6 August. Ride to the Country Inn, Bepton. Arthur led this ride and was joined at Chichester Cross by Brian from the Isle of Wight, Harvey and Keith Dodman. Weather was warm and humid reaching about 25C with cloud and sunny spells. The group took a direct route up the Centurion Way to West Dean and then the main road via Singleton to stop for elevenses at The Moonlight Cafe, Cocking. I (Edwin) met the group at Cocking riding there direct after riding an early morning 25 mile time trial and returning home to change bikes. Alan and Liz also rode direct to Cocking and we met Adrian at the Pub making a total of 8 out on the day. We took a direct route to the Pub on lanes arriving at about 12.10 beating Horsham Section for a change by about a minute. We were glad to get our food orders in first as service was fairly slow. 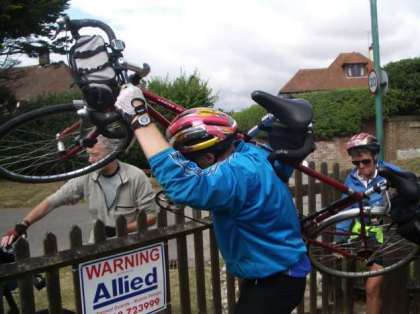 We had a chat to some Horsham Section members about good routes in the Chichester area. We returned on the same route and into Lavant. Alan, Liz and Harvey rode on to Aldingbourne for tea while the rest of us went to Goodwood Flying Club for tea. My mileage on the Club Ride was 39 but with the addition of 51 miles done earlier on the 25 and riding there and back my total for the day was 90 miles. Saturday 5 August. Climping Beach Picnic Ride. 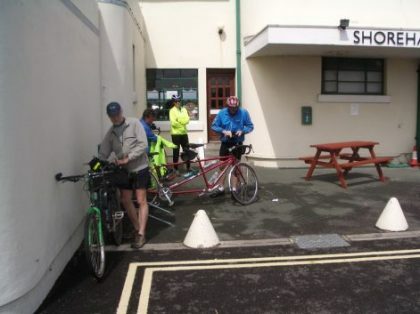 I (Edwin) led this Ride and I was joined at Bognor Library by 10 others including Dawn and Fred and Philippa and William. Weather was warm and sunny at about 24C. We took backroads and Cyclepaths to Felpham and then Limmer Lane to the Summerley Estate. Then more back- roads via Ancton and Elmer. Then along the beach involving some walking over the pebbles to Climping. We settled on the beach for a late picnic lunch and some sunbathing and a few of the more energetic took a swim. At the beach we met Alan and Liz and Julian and a friend taking total numbers out on the day to 15. We took a fairly direct route back with a stop for tea at The Lobster Pot cafe on Felpham Seafront. Saturday 29 July. BBQ @ Phil & Mary's House, Runcton. selection of excellent cakes for dessert. require waterproofs. My mileage for the day was 66km. Sunday 30 July. Chichester Start for ride to Wisborough Green Picnic. 7 of us met at the Cross, myself (Edwin) Phil, Mary, Ann, Avryl, Jeff and Richard. Weather was cooler than of late at about 24C but dry and mainly sunny with scattered cloud. We took a route out via Goodwood Park and then over the Downs to Pillygreen Lodge and down to East Dean and the lane to Upwaltham. We descended Duncton Hill where Richard left us to return via Graffham. We continued on lanes to stop for elevenses at Tiffins in Petworth. We looked on with some interest over our tea and cakes as 2 mounted Hussars in full dress uniform rode past on the way to a festival at Petworth House. We continued on beautiful leafy lanes via Balls Cross and Kirdford to Wisborough Green. 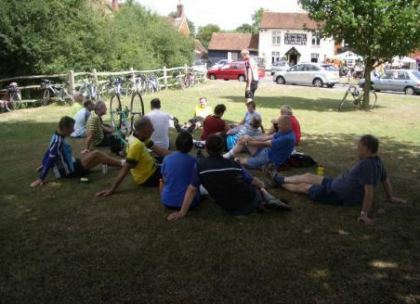 Horsham Section members were already well settled at the Pub and we set up camp for the Picnic under a tree opposite the Pub. We were soon joined by Arun Adur members and Harvey with Alan and Liz making up the Walberton Pond start and Colin and Chris who came direct. Ernie and Nicola also came direct. 30 attended the Picnic in all. For the return ride our members with Arun Adur members formed a big joint group of 17 to ride via Kirdford and Byworth to stop for tea at the Sutton Hospitality Festival. Mary had seen the sign for this on the mornings ride and we had come across it 2 years ago when they did excellent teas at the Vicarage. 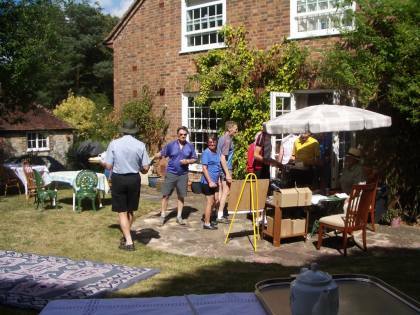 Luckily the same arrangement applied this year and we were soon settled in the Vicarage back Garden. We would make this a regular Tea Stop but unfortunately it only opens once every 2 years when the festival is held. 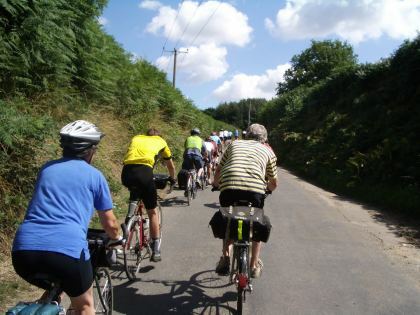 Arun Adur members headed back east and the rest of us took a little used route up Bignor Hill, steepest in Sussex. Then down the track on the other side to Madehurst and back to the coast. 60 miles done by the time I returned home. I (Edwin) led the ride meeting Graham and Chris at The Fox. We headed along the Seafront road to Pagham and then on to tracks. First on Summer Lane and across the fields to Honer Lane. Then up to South Mundam and another track across fields to Hunston. Then both sections of the Canal to come out by the entrance to Chichester Yacht basin. We then took the road to Dell Quay to meet up with the Chichester group including Phil and Mary, John and Richard and family. As we had drinks in the Garden there was red sky to the NW as the sun set with ominous dark clouds with occasional lightning flashes to the SE. The weather radar on the Internet had shown massive storms tracking up the channel and moving inland further east. We had escaped rain so far but decided to make an early return. Chris headed straight back to Littlehampton and John joined Graham and I for the ride back. As we headed down the Pagham Road at a fast pace a little light rain started and ahead of us forks of lightning pierced the gathering dark clouds ahead of us. I reached home without needing waterproofs. About 28 miles from and back to Felpham. Phil, Mary and John left the cross on another sultry evening. We headed south to the yacht basin and followed the canal down through Hunston to the entrance to Chichester Marina. We then followed the A286 south west to the roundabout, and made our way back through Birdham to re-cross the canal by the footbridge in the Marina. There was little activity in the marina as we crossed over the main lock gate and took the path through the woods to meet the lane just east of Appledram and finally made our way to the Anchor. It was an evening of vivid colours. The weeds in the canal were bright green. The tide was low and the mudflats also showed green vegetation. The sun setting in the smoggy west was a brilliant red. To the south, another evening thunder storm provided flashes of forked lightening and rumbles of thunder. We were joined by Richard, Elizabeth & family, then the group from Bognor led by Edwin. We, Liz and I (Alan) met Dawn, Fred and Sonja at Quarry Lane en route to Chichester Cross. There we met Harvey. I suggested a route via Emsworth taking Clay Lane to the A259 and Southbourne to Emsworth where we met Roy Wasdell. We took the track through to Westbourne and then on to Rowlands Castle. Richard Boulton of Arun Adur joined Phil, Mary and Edwin at Chichester Cross for the 9 am start for Exton, Hampshire. We headed north on the Centurion Way and then crossed by Binderton to join the Chilgrove Road which we followed until the turn to East Marden. The weather was cooler than of late (average 25 degrees for the day) but it was still comparatively humid. From East Marden we followed minor roads westwards until we crossed the railway line north of Rowlands Castle and climbed the steep hill to Chalton. A tentative plan to take the footpath north to the visitor centre was abandoned due to time pressure and excessive undergrowth so we continued to cross the A3 and then re-cross to the Queen Elizabeth Country Park Visitor Centre. Adrian was waiting in the coffee shop and after taking refreshments we headed back into Clanfield and then climbed up to the Meon Ridge for the usual spectacular ride along the ridge, eventually descending to Warnford from where we followed the A32 south to Exton, and the Shoe Inn. Our return route took us through Chidden and past the Bat and Ball pub to a rather hair raising crossing point on the A3. We have not used this for some years and the traffic is both faster and denser than prior crossings. Adrian turned south just prior to Clanfield. We continued to Rowlands Castle for tea where we were joined by Sam and Graham who then returned towards Chichester with us, through Funtington and then down Watery Lane to pick up the South Coast Cycle Route back. We covered about 100 km but at a reasonably good pace so we were back in Chichester soon after 4 pm.